I promised to search around for some more evidence that local councils approve far more dwellings than are built. This would go some way to addressing the argument than planning is restrict, particularly zoning controls and approvals processes. 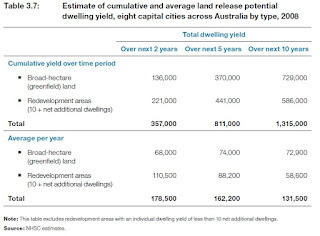 This report, by the Queensland Office of Economic and Statistical Reseach, adds to the previous evidence on a deevlopment approvals for subdivisions greatly exceeding the ability of the market to absorb the new land. It outlines the number of development approvals for infill multiple unit dwellings in the pipeline at various stages of approval for South East Queensland. The telling figure is that there are 48,152 approved new infill dwellings in SEQ, with another 29,014 at earlier stages of approval. Remembering that there are also 30,566 approved subdividede housing blocks, we have a total approved supply in this region of 88,718 dwellings! Even at its recent peak population growth in SEQ was only 88,000 per year. 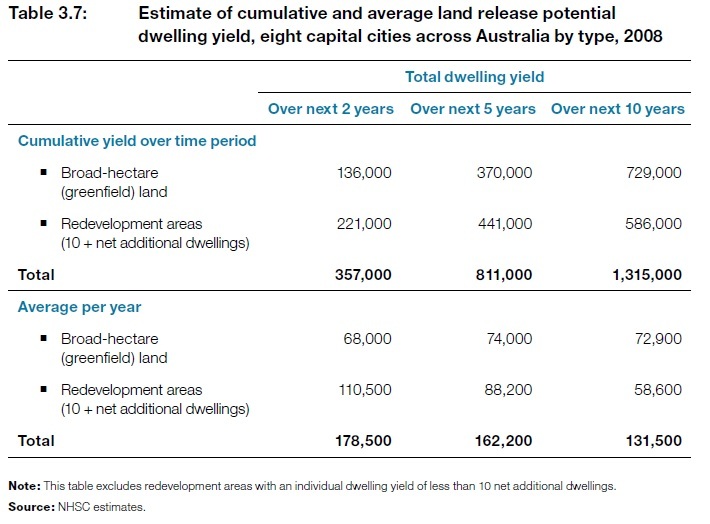 That makes about 2.5 years supply of dwellings already approved. Other government reports which have compiled useful information on the potential housing supply available under current planning regimes. Moreover it explains that the stock of approved lots represents 3.3 years supply. We can take a look at a national level here and see that current planning schemes have the potential to yield 131,000 new homes per year for a decade from 2008! This excludes the increase in housing stock from developments with less than 10 dwellings. In the abovelinked OESR report they state that smaller developments of 10 or fewer dwellings accounted for 69.5 per cent of projects at June 2010. This means the estimate of 131,000 new homes accounts for only 40% of the actual supply available under current planning schemes. Even so, they sum up their analysis of land supply by stating that there was approximately 7–8 years supply of zoned broadhectare land in 2007. Academics have frequently arrived at findings, re various markets in the USA, that land supply restrictions were, say, "responsible for 30% of bubble price inflation", while "easy credit" and other causes were responsible for the other 70%. This is completely inadequate to explain why some markets that HAD the easy credit and the other causes, had no house price inflation at all - if these things were "70% responsible", why did these markets not experience "70% of the price inflation" - and rather, experienced NONE? The possibility that demand of a speculative nature can be endogenously created by supply restrictions, would explain a lot. It is also perfectly possible under these conditions, to actually be building houses, and both new and old houses to be selling at inflated prices, and the numbers of houses that are completely empty, to be rising. This is because speculators can become so enamoured of capital gains, that they do not even bother with tenants. It is also because more and more potential home buyers are not "leaving home", or are "doubling up" with relatives or friends. Of course, the "bust" is bigger because of this. Watch this space, Australia....! The bust is also bigger because some property holders, of both existing properties, and developers bringing projects to completion, are forced to "cut their losses" in a falling market. This fits the theoretical "inelastic" supply curve that shows potential for more rapid price falls as well as more rapid price rises. Oh, bother, I posted a lot of comments on your earlier thread and they have disappeared. What's the story? Why post a lengthy thesis, and avoid having anyone engage with it at length? Anon (1), I'll read the papers you mention, but I understand what you have said as - if there is an expectation of supply restriction (real or imaginary) it will increase speculative demand, even if supply is being adequately constructed. Correct me if that's in fact not correct. Anon (2), I have problems with the comments also being erased when I try to submit them. Best to copy the text first so you can paste it back in if there is a problem. Anon (1), I've read the Malpezzi and Wachter paper. Quite an insightful simulation exercise. Although the thing I think they failed to adequately explain is that their simulation was of a demand shock - a once off 20% increase in demand (a shift of the curve to the right). The fact that demand (willingness to pay) increased 20% in a single period while supply was fixed for that period is irrational. Under both elastic and inelastic models prices returned to equilibrium in the long run. Therefore, there is never a reason for a demand shock to occur in the first place - everyone should know that they can wait for prices to return to their original level. I feel the paper would have been far more informative if there were many more simulations. For example, they could shock demand at 3% each period for 3 years to see whether how the differences between models disappear as the shocks get to more realistic levels. I am Wodehouselee, and Anon 1 and 2 - I am having trouble posting. Each of the comments I refer to earlier, did appear on the blog successfully, and I then went on to do the next one. A few hours later, they had almost all disappeared. It is obviously very difficult to build such a model with demand rising from a low base. I think Malpezzi and Wachter make their point very well. Their explanation DOES explain why a demand shock of nearly ANY size can result in a boom in actual construction of houses in one market with minimal price movement (eg most cities in the USA), and yet trigger a catastrophic bubble in prices in markets with inelastic supply. I also think it would explain a lot, merely to regard demand curves as also highly inelastic, whatever occurs in overall shifts in this curve. This also helps explain the volatility of bust phases, because a shifting demand curve results in equilibrium prices moving rapidly downwards, even if these shifts are strongly "downwards sticky" in real life - they have to come eventually. ".....everyone should know that they can wait for prices to return to their original level...."
IF ONLY. I have caused scenes at numerous social evenings by suggesting that first home buyers should hold off until prices have reverted. Kieran Trass' books on housing market cycles are informative, but he does not discuss the problem with the new highly volatile price bubbles (consequent on land supply restrictions), is that they cause so much economic damage that in the "bust" phase, so much retrenchment is going on that many young people simply cannot buy in the dip regardless of how much they might like to. This is one reason why nations with this problem suffer steady actual SHORTAGES of housing (UK) as the first phase is succeeded by later ones. Another reason, is simply that developers leave the industry permanently, either by bankruptcy or by choice. As I commented on the earlier thread, a few years "supply" of land is totally insufficient to prevent these effects from occurring. The consensus among the leading analysts today, is that 30 years supply is necessary for price stability. Because the circumference of cities is so long, this actually does not have to involve many km's of distance out from the existing built fringe. Viewed on a map, "7 years supply" is a visually miniscule amount.